Begin this tour in Nelson (Highway #3A). 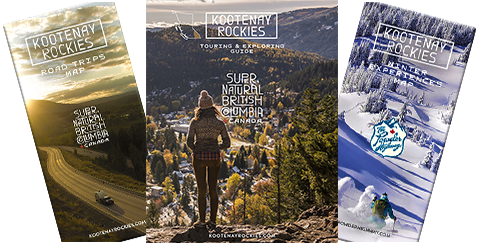 The Nelson / Kootenay Lake area brims with mountain culture. Nelson got its start in silver mining, but is now known as one of the best small arts communities in North America. Explore Nelson's many fine heritage buildings - from elegant mansions to elaborate commercial structures - through the Heritage Walking Tour. Touchstones Nelson: Museum of Art & History celebrates the city's creativity and vibe. Nelson offers world-class outdoor recreation and watersports such as kayaking, stand-up paddleboarding and canoeing. Nelson to Kaslo is 70 km / 43 mi. Take Highway #3A along Kootenay Lake. Kokanee Creek Provincial Park offers a campground, sandy beach, hikes through Old Growth Cedars and nearby Kokanee Mountain Zipline. Balfour is a small but vibrant community with many visitors services. It is the location of the free ferry to Crawford Bay. Continue north on Highway #31 to the famous Ainsworth Hot Springs to rejuvenate in the hot, natural, mineral springs water. Kaslo is one of British Columbia's prettiest villages. The wide tree-lined downtown and stately old houses exude charm. It is home to the world's oldest passenger sternwheeler, the SS Moyie, an international treasure. Heritage attractions includes the Japanese Canadian Museum, Kootenay Star Museum and Langham Cultural Centre. The Jazz Etc. Festival takes place every August long weekend - superb musicians perform on a unique floating stage. Kaslo to New Denver in the Slocan Valley is 46 km / 28 mi on Highway #31A. Sandon is British Columbia's legendary ghost town. Experience the silver rush of the 1800s. Historical treasures include the City Hall, Interpretive Centre, Generating Station, Prospector's Pick gift shop and Museum. Idaho Peak is a wonderful and easy hike showcasing wildflowers, an old fire lookout and mountain views - the access road stats at Sandon. New Denver has a lovely setting alongside Slocan Lake. The Silvery Slocan Museum is located in a heritage building, and the Nikkei Internment Memorial Centre tells the story of the internment of thousands of Canadians of Japanese descent during WWII. Silverton to Crescent Valley is 79 km / 49 mi via Highway #6. Silverton offers an outdoor mining museum, Fingland Cabin and a Blacksmith Shop at the Historical Interpretive Centre. Various public boat launches are available in the area. The village of Slocan gives road access to Valhalla Provincial Park. Winlaw is a funky little town and home of the Kootenay Craft Distillery. Enjoy exploring the rest of the spectacularly beautiful Slocan Valley. Hiking in Kokanee Creek Provincial Park. Nelson's waterfront is a great place to be in the summer. Kaslo's SS Moyie is a National Historic Site. Kaslo River Trails includes two beautiful bridges. Explore the historic townsite of Sandon. What makes the hot springs water Hot?